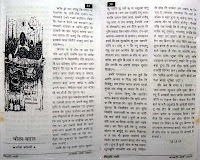 ‘Chola Badal’ a satirical article by famous Garhwali Poet and famous Garhwali language blogger Dhanesh Kothari talks about exploitation of mass by political and crook leadership. Kothari is surprised that in spite of high literacy rate in rural Garhwal people are getting exploited by leaders. Kothari at the end provides message not to get exploited. The language belongs to Devprayag region and there are phrases those create disappointment on exploited people.